Makkal Needhi Maiam responded saying that Kumaravel had not acted in keeping with the ‘democratic tenets’ of the party. 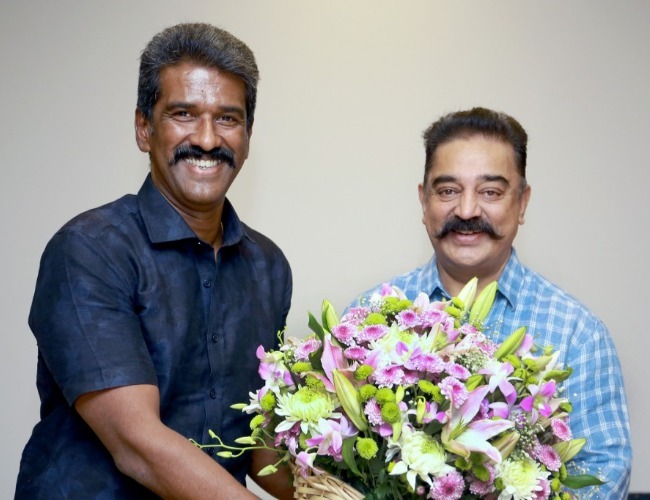 CK Kumaravel, CEO and co-founder of Naturals Salons has quit actor-turned-politician Kamal Haasan’s Makkal Needhi Maiam (MNM), citing internal politics. The businessman had joined Kamal’s core team soon after the actor launched his party in February last year. On Monday, over a year later, Kumaravel quit the party in a letter to party chief Kamal Haasan. Speaking to TNM, the businessman says that while he still believes that Kamal has a good vision for Tamil Nadu, the team around the newbie politician has mired itself in politics, unbecoming of a new party. “The reason for quitting is internal politics,” he declares, while pointing out that the entry into the party of Dr Mahendran escalated matters. Doctor and vanilla farmer Mahendran was appointed MNM's Vice President in November last year. “With Dr Mahendran coming into the picture, the internal party politics increased multifold. When someone is getting announced as joining the party as Vice President 30 minutes before a programme, it becomes very difficult to manage the front end,” says Kumaravel. However, in a statement to the press on November 28, the party had stated that a resolution to institute Mahendran as VP had been passed by the party’s Governing Body and Executive Committee on October 8, 2018. Kumaravel says, “Kamal has a good vision, he puts in a lot of effort. But the team around him is detrimental to him, the party and to his vision.” Did Kamal try to persuade the businessman to stay? “No, I think he’s busy,” he replies. Expanding on some of the issues that provoked his decision, Kumaravel says, “A start-up party like ours should be a lot more agile. But we are the last to announce candidates (to the 2019 Lok Sabha polls). We should have made the announcement a month ago and started groundwork by now. This was the advantage that (former Chief Minister) J Jayalalithaa had over (former Chief Minister) M Karunanidhi. She would announce her candidates well in advance. The bigger parties have announced their lists. This shows where the priorities lie. Things are going from bad to worse. Someone needs to bell the cat. So I said okay, let me sacrifice myself.” On Monday, the party issued a statement setting the date for the Lok Sabha candidates announcement on March 20. Kumaravel also recounts that when he joined the party, he had done so with much enthusiasm and energy, smitten as he was with Kamal Haasan’s vision for Tamil Nadu. “A lot of people told me that I was being foolish. But I told myself that if I don’t go and support him (Kamal Haasan) now, then I will have no locus standi to speak later,” he says. Clarifying that he will not be joining another party, the businessman adds that his stint with MNM had left him richer in life experience. “Makkal Needhi Maiam has a strict zero tolerance policy on applicants violating party principles for which MNM gives utmost importance. This is more so on applicants not communicating pending decisions to any media/social media ahead of the party leadership’s formal statement on the same especially when there were more than a few hundred applicants waiting to be interviewed in a democratic manner,” it said, pointing out that 'he had not even sat down for his interview with the panel' when he allegedly posted the status updates on social media. Note: This story has been updated with Makkal Needhi Maiam’s response.